The Precision submenu contains commands which let you change the precision of the image. The Precision options affect the precision and channel encoding used for storing the image in RAM during processing. You can access this submenu from the image menubar through Image → Precision. The Precision Menu is divided into two parts: precision and channel encoding. Linear light, which encodes the channel data using the linear gamma TRC. Regardless of which options you choose in the Precision menu, in high bit depth GIMP 2.10 all internal processing is done at 32-bit floating point precision, and most editing operations are done using Linear light channel encoding. To take full advantage of GIMP's internal 32-bit floating point processing, choose 32-bit floating point precision and also choose the Linear light channel encoding. If you are editing on a machine with limited RAM, or if you are editing very large images and layer stacks, consider using 16-bit floating point or integer precision. If you want to take advantage of high bit depth image editing but you don't want to deal with floating point channel values, then use 16-bit integer precision. When soft proofing an image, switch to Perceptual gamma (sRGB) channel encoding to avoid certain problems with soft proofing a linear gamma image using Little CMS. On a very low-spec machine with not very much RAM, consider using 8-bit integer precision, in which case also choose the Perceptual gamma (sRGB) channel encoding (at 8-bit precision, if you choose the Linear light channel encoding your image will have horribly posterized shadows). The bit depth of an image sets limits on how much precision is available when processing your image files. All things being equal, higher bit depths provide more precision. The bit depth of an image file partially determines how much RAM is required for processing. The higher the bit depth, the more RAM is required to store data during image processing. Other relevant factors include the size of the image layers and the number of layers in the layer stack. Floating point precision is required for taking full advantage of high bit depth GIMP's internal 32-bit floating point processing. Floating point precision allows for the generation and use of channel values that fall outside the display-referred range from 0.0 ("display black") to 1.0 ("display white"), thus making possible very useful editing possibilities such as unbounded ICC profile conversions and High Dynamic Range scene-referred editing operations. 8-bit integer values are clipped to the range 0-255. 16-bit integer values are clipped to the range 0-65535. 32-bit integer values are clipped to the range 0-4294967295. At any given bit depth, all things being equal integer precision is more precise than floating point precision. So 16-bit integer precision is more precise than 16-bit floating point precision, and 32-bit integer precision is more precise than 32-bit floating point precision. However, in GIMP you don't get more precision by choosing 32-bit integer over 32-bit floating point: GIMP still does all internal processing using 32-bit floating point precision even if you choose 32-bit integer precision in the Precision menu. Remember, the Precision menu choices only determine how the image information is held in RAM. At any given bit depth, integer and floating point precision use approximately the same amount of RAM for internal calculations during image processing, and also require about the same amount of disk space when saving an image file to disk. At 8-bit precision, if you choose the Linear light channel encoding your image will have horribly posterized shadows. So don't use Linear light unless you also choose a higher bit depth. When soft proofing, currently the gamut check will not return correct results if the image is at Linear light precision. So change to Perceptual gamma (sRGB) before activating soft proofing. Currently if you choose "Linear light", then linear gamma channel values are displayed in the "pixel" values when using the the Color Picker Tool, Sample Points, and Pointer dialogs. 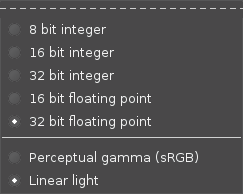 If you choose "Perceptual gamma", then perceptually uniform (sRGB) channel values are displayed instead. Currently the channel encoding that you choose makes a difference in the wrong colors that you might see if you uncheck Image/Color Management/Enable Color Management and your image isn't already in one of the GIMP built-in sRGB color spaces (but with either channel encoding choice, the colors are still wrong). The only other way (that I know of) in which the channel encoding chosen in the Precision menu might affect your workflow has to do with results of using the "Gamma hack" found in the Advanced Color Options.